My Favorite Accessible Destination in Europe! Home »Disabled Travel Newsletter »My Favorite Accessible Destination in Europe! If there’s one place in Europe I could visit over and over again it would be Tuscany… It has everything that I love about Europe… world-class art and architecture, significant history, beautiful landscapes, exquisite food, and friendly local people. 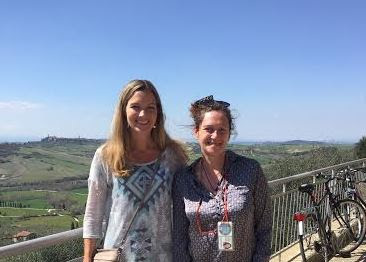 Whether you’ve already been to Italy and loved it (and can’t wait to return), or you’re thinking about planning your first memorable Italian vacation, you won’t regret visiting the quintessential region of Tuscany! When I travel, I want to experience as much as I can while still having a comfortable “home base” where I can relax and recharge at the end of the day. If you choose a centrally-located accessible hotel or villa in Chianti, Siena or Val d’Orcia valley, you can easily visit multiple destinations with day-trips during your stay. Because the region is peppered with so many different villages and sites worth visiting in close proximity to each other, you’ll literally have endless options of things to do… Spend a day exploring in the city home to Italy’s most popular art collection, Florence, experience breathtaking Renaissance architecture in Siena and enjoy world-class wine and authentic Italian cuisine in the lush Chianti Country side – all within the same week! Tuscan cuisine is world famous and for a good reason of course! While you’re in Tuscany, why not learn cooking techniques from a professional local chef? The Accessible Italian Cooking Class in Tuscany is held on a small farm using ingredients gathered locally. Instructed by your chef, you’ll be preparing 4-5 courses including appetizers, a pasta dish, a meat dish and of course a dessert! Oh… and you get to eat it all, too! My wife Tiffany and I during our cooking class in Tuscany! She loves Tuscany just as much as I do! This is hands down one of the most unique vacation activities I’ve ever experienced! The accessible private sightseeing flight over Tuscany allows you to see mountains, valleys and villages from the sky. We’re not talking about viewing the ground from 30,000 feet…you’ll be up around 1200 feet which means you can see everything up close! The planes used for the tours are low to the ground making it easier for disabled passengers to enter, and the pilots are officially-licensed and very experienced. You’ll be amazed at how relaxed you’ll feel during the fight! With visits to two beautiful Chianti wineries, three different villages, and the impressive medieval walled town of Monteriggioni, theaccessible driving tour of Chianti wineries and villages will leave you with memories and photos to last a lifetime! Food, food and more food. No wonder this is one of my favorites, too! 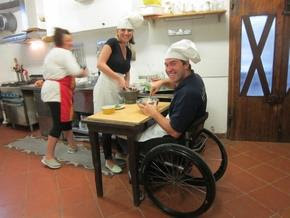 On the accessible food tour in Siena you’ll visit 5 different accessible Siena restaurants for a complete 5 course meal. Yum! During the tour, your private guide will lead you along wheelchair accessible routes to travel between each of the restaurants. All five restaurants have step-free entrances and accessible bathrooms. 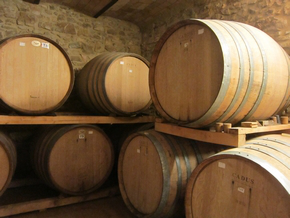 They are non-touristy establishments serving authentic Tuscan cuisine and house wine. Accessibility in Tuscany is very different from what you find in other major Italian cities. In Rome you might deal with long distances and few accessible transportation options and in Venice it’s the bridges that poses a challenge. In Tuscany, you won’t have those same challenges but due to the terrain and history of the region, you will encounter steep hills, some inaccessible buildings and cobblestones in several places. Don’t let that discourage you from experiencing this beautiful Italian gem! With the right planning, the accessibility challenges can be circumvented and you’ll be able to have a wonderful vacation time! If you’ve never explored the Tuscan countryside (or just loved it so much you want to go back), 2016 is a great year to do it! 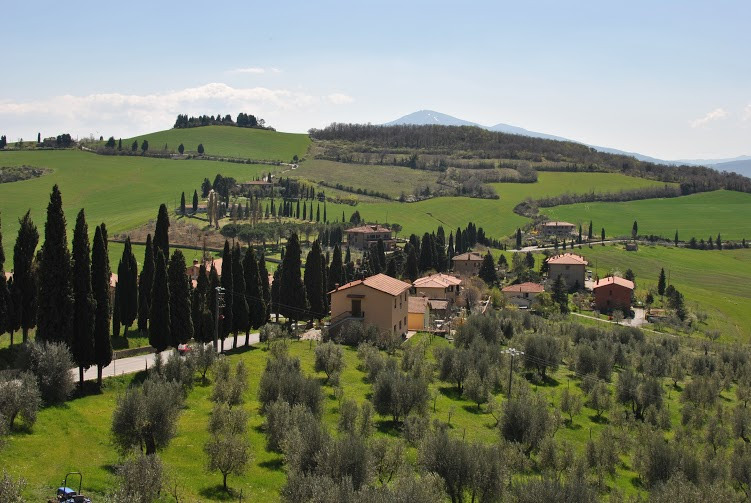 Did you know that we offer comprehensive Accessible Travel Packages in Tuscany? I have personally inspected accessibility in numerous Tuscan cities so we can recommend the perfect itinerary for your interests and accessibility needs. *Many accessible villas only have one accessible room and they are often booked many months in advance. Contact Jennifer to start planning today!